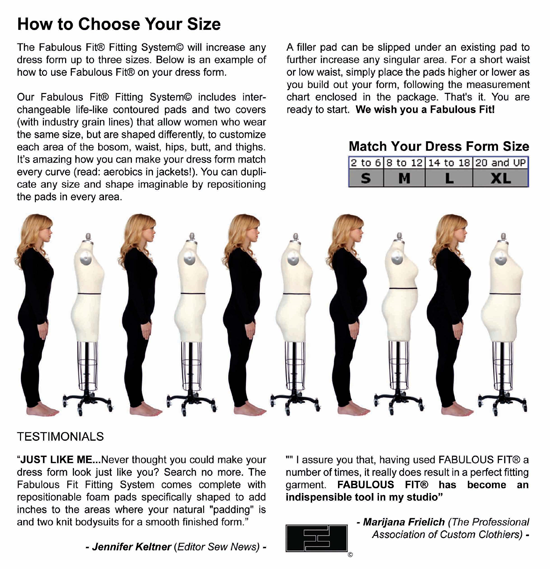 Duplicate your size and shape in a few easy steps. It works with every form, no matter what the style or age. Why are all the pads the same size even though I ordered different sizes? The sizes of the Fitting Systems are determined by the size of the covers. All of the padding sets are the same…larger sizes will use all the pads, for example, and smaller sizes will use some of the pads. 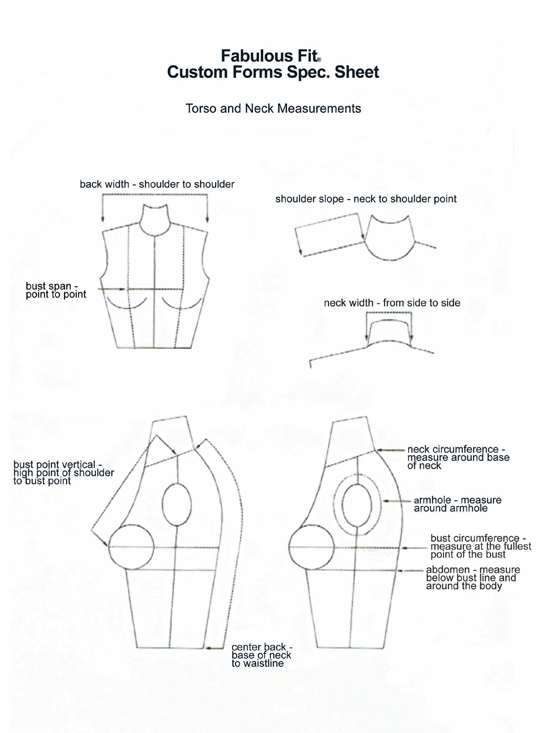 For the first few times I recommend that you use the Fitting System at your own pace, especially if you are new to dress forms. It's extremely important for you to PLAY! 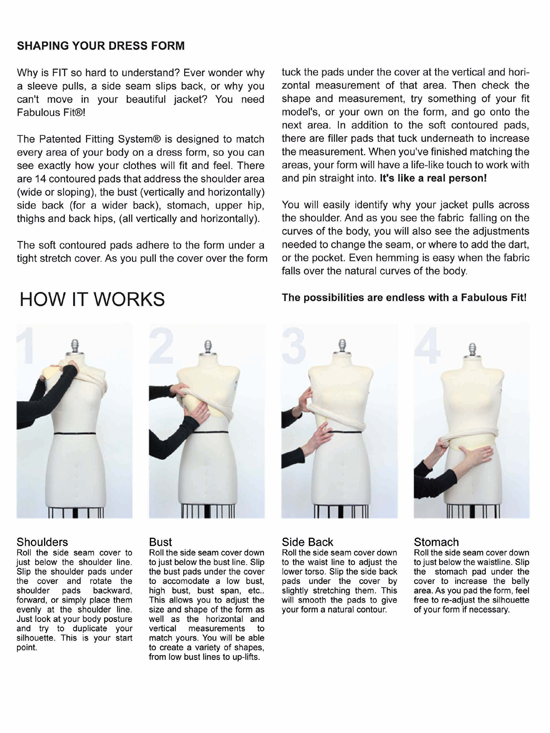 This will give you a little time to discover the benefits and flexibility that the Patented Fitting System offers, plus new insights to techniques that will enhance your creativity. TIP: I suggest that you slightly stretch each pad along the body of the form to smooth the silhouette. You will receive a package with 13 molded contoured pads, two sets of filler pads, and two body covers with industry regulated seams. The foam pads in your package are marked for their best positions. The pads are also interchangeable, and can be used in different areas of your form. The 5 large contoured pads are for shaping the lower body of the form. 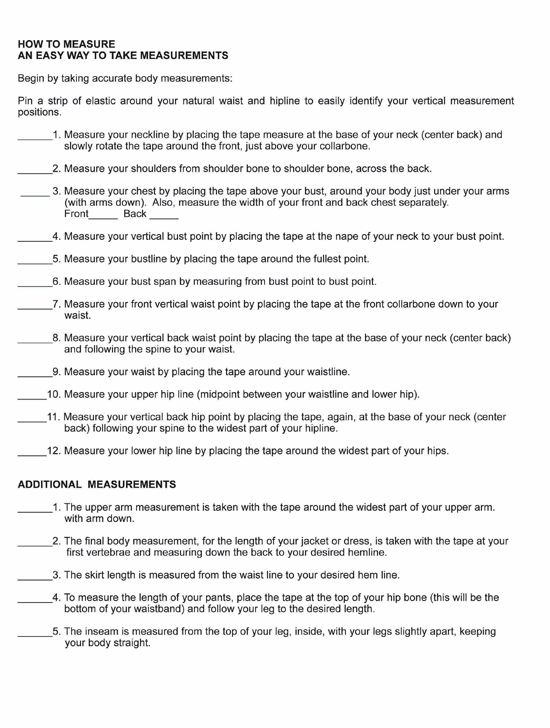 Before you even start taking measurements, try something of your own on the form, then sit down and look through the instructions that come with your form. TIP: Use the filler pads to give the long contoured pads more definition for each area. A filler pad would work best placed under the middle section of the stomach pad. For a high upper hip, place the filler pad higher, under the contoured pad. You will get a smoother upper hip. Slightly stretch the pads against the body of the form while placing them under the first cover, (Side seam cover) to get a very natural shape. Had an issue with late shipment but after reaching out to customer service they were able to easily follow up and get more insight on my package. They ensured it arrived in time for my trip the next day so I was happy. I was very pleased with the pricing as well as the shipping time. A store that I went to that's an hour away from my house is affiliated with the items that I purchased. But the brand that they carry we're on backorder and would not be shipped out until May. I was very excited to know that my full body dress form will be delivered to me in just a few weeks, after ordering it online that same day. as well as my Fabulous Fit sizing kit. thank you to the girls who process the online orders/payments for all their help to get my order through. I was extremely impressed with all their help. Keep up the great work. I am very pleased with the purchase I made. I found your presentation of the item to be clear, concise and I know what I was ordering. I am pleased with the fast service and overall experience of shopping with you. The above order arrived safe and sound today in plenty of time for Christmas. Many thanks for all your efforts to serve an international customer. I suspect it can be a bit messy from your end. Your level of service and communication is much appreciated. Very happy with the product, service, and the price. Your lower shipping cost made a difference. I have ordered several times and have always been satisfied. Thank you so much. Your website was very easy to use and the customer service was great when I had questions. I would definitely order from your website again. This was half the cost on other sites so I am very impressed. I am very pleased and happy with the purchase from AllBrands. My daughter has not had the opportunity to use the product yet though. I was very impressed by their quick shipment and delivery of the product- especially during the holiday rush. I would definitely do business with AllBrands again. Happy Christmas, and thank you My package with the Fabulous Fit pads and cover for my dress form arrived, and I was able to modify my own form in order to drape and prepare a pattern for my Mother. I'll be making her a Vogue Wardrobe of top, pants, jacket and coat for spring/summer. The pads are wonderful, just the right conformation to allow a fine fit for me to do long distance fitting for my mother. She's 97, still active, and be pleasantly surprised with her new outfits. 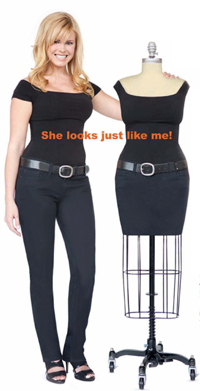 My sister, who lives with her, and I are 'conspiring' with your help to make her outfit. Thank you for your prompt shipment. I really appreciate the service, and the valuable new tool in my sewing 'quiver.' 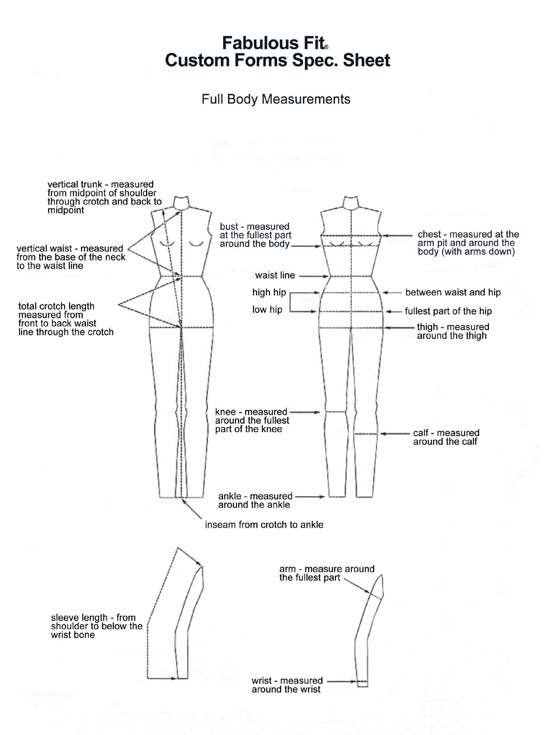 I can now make my dressform do multiple duty for many different body shapes. This is really wizard-wonderful. Thanks for all our great fitting new clothes from my whole family. Thank you for responding so quickly - you guys have amazing customer service!